Summary: Every working day in Bombay, India, people pack up hot lunches for their loved ones to be delivered in tiffins to their work places. Kunal’s life is changed before he is even born when his mother, Anahita, slips an important note into the tiffin she’s sending out, and it never reaches its destination. Years later Kunal believes he is an orphan, and he works in a restaurant owned by the people he lives with. Exploited and in physical danger, Kunal takes Vinayak, a tiffin deliverer, up on his offer to provide a home. When he finds out he’s not an orphan after all, Kunal seeks to use the tiffin system to find his mother. Review: A heartfelt story about the true meaning of family, The Tiffin by Mahtab Narsimhan gives insight into the colourful world of India. I loved Narsimhan’s writing because she took me right to the streets of Bombay with the frantic yet highly organized sorting and delivery of the tiffins. The thought of tiffins holding notes ranging from messages between lovers to grocery lists was especially intriguing, and the premise of the one lost tiffin containing the most important message of all made me think. How different would Kunal’s life had been if that tiffin had made it to its destination? Maybe it wouldn’t have changed at all because Anahita’s lover would have stood her up anyway, but it’s easy to imagine a happier family for Kunal. Except even though Kunal didn’t get the family he expected, I absolutely loved the family he ended up with. Narsimhan shows her reader that family doesn’t have to be blood related to be family, and sometimes shared grief is a greater unifier than blood. Yinayak is my favourite character when he looks out for Kunal, taking him under his wing when he needs it the most. When Kunal encourages him to recover because he needs his family, I almost cried. And surprisingly, while Mrs. Smith seemed rather heartless at first, she actually turns out to be a surrogate mother for Kunal. Though he saw himself as an orphan, he had more family around him than he ever realised. I have to say that now I want to know more about the tiffin system though. Do people hire others to make their tiffins everyday? How did Anahita meet her lover? Did they just start sending notes to each other through tiffins and then meet up in person? I know that wasn’t the focus of Narsimhan’s story and I did love the story as it was, but I can’t help being curious. The Tiffin is highly enjoyable read and while there is some violence, as well as characters who seem to about to abuse Kunal, I still think it’s a suitable book for early teens. 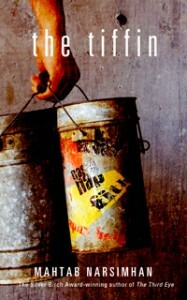 The Tiffin by Mahtab Narsimhan is published by Dancing Cat Books, (2011).